 A BEAUTIFUL BRACELET FOR EVERYONE: Are you looking for a simple yet impressive bracelet to wear all day and match all your outfits? Then you are looking in the right place. These nautical style bracelets are carefully designed to look perfect each and every time you wear them. Small details make a big difference, right?  TOP NOTCH QUALITY: THE U.S. Nautics have created a series of bracelets all made of the highest quality materials to ensure the durability of your new favorite accessory. Made of great quality nautical rope and with the stainless steel buckle they feature make sure that this bracelet will stay in your wrist for years. Even under water, this buckle will not rust, corrode or lose its shine. 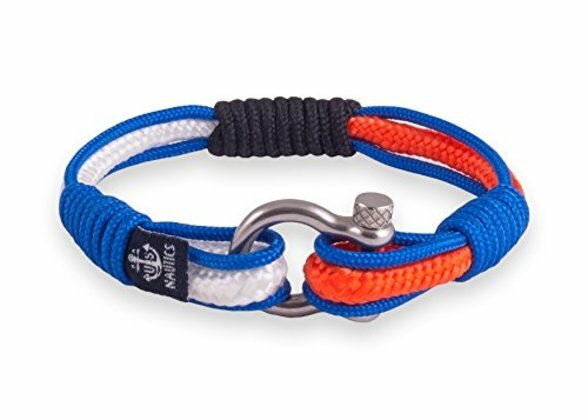  STUNNING DESIGN: These bracelets combine two or three different colors and along with the detailed nautical knots they have, they look just amazing. The vivid colors and the thorough design, along with the discreet anchor tag, make this jewelry a must-have for summer!  COMFORTABLE TO WEAR: Unlike metal bracelets that are harsh with your skin and may cause irritation, these bracelets are so soft and comfortable that you can wear them 24/7 without even noticing it. Thanks to their adjustable size they can fit perfectly from the tiniest to the biggest wrists.  A UNIQUE PRESENT IDEA: Do you want to offer a beautiful present to your beloved ones without breaking the bank? Would you like to give them something that they can always keep on them? Then this is the best choice. No matter if the receiver of this great gift is a man or woman, a real sailor or not, make sure that these bracelets will make the best impression!